Construction junkies and engineering types may appreciate this discussion at a language-related blog I read, written by the top copy editor at the Baltimore Sun. An engineer writes in to say he’s absolutely fed up with people who think cement and concrete are the same thing. One current word usage continues to bother me. It is the use of the word “Cement” when the writer or speaker means “Concrete.” I learned the difference between the two terms more than fifty years ago in the School of Engineering at Johns Hopkins. I know that the language evolves, but this particular evolution tends to be confusing. Cement or Portland cement, to use the technical name, is a greenish-gray finely ground powder that is one of the ingredients in concrete. The Portland Cement Association, a trade group representing manufacturers of this material, maintains an informative web site at www.cement.org/basics. When this manufactured chemical is mixed with gradated aggregates—usually coarse sand and either gravel or crushed stone—and water is added the resulting mixture is concrete. A chemical reaction will then take place that will cause the mixture to harden within a few hours. If the ingredients have been properly proportioned, and if the product has not been subjected to climate extremes, in approximately 28 days, this man-made conglomerate will become strong enough to withstand a compressive force of 3,000 pounds per square inch or more. Concrete is an ideal construction material. Because it is put in place in a semi-liquid state, it can be molded into shapes that are structural or decorative or both. However, it is concrete, and cement is just one ingredient. Therefore, to speak of a cement sidewalk or a cement mixer does not make sense. Read the comments to find out where “tarmac” comes from, and why no respectable airport employee ever uses the term. What is that contraption, anyway? Seems there’s a popular tourist destination off the British coast called Burgh Island. You have to cross a narrow sand isthmus to get there, but at high tide the isthmus is under water. 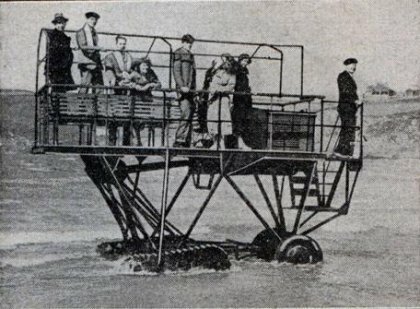 So, a ferry was invented to take people there without soaking their pant legs. The picture above is from 1936. An updated version of the ferry is still in use (with fat tires instead of tracks). WikiPedia has more info on Burgh Island. Caterpillar framed the lives of everybody in the Peoria area in the 1970s, when I was a teen-ager. Most of us were aimless and ambition-depleted, perhaps because we figured the surest path to nice new cars and houses in the ‘burbs was a job on the line at Cat. People went to college, I guess, if their parents had gone to college, but most of us figured Cat would provide. We were in for a hell of a wake-up call. An uncle of mine worked as a foreman for a Cat supplier, a production-machining company out in Metamora. He hired his eldest son first, then another of my cousins, and then me. I ran a radial drill for a year and a half, cutting big and small holes in these parts called brake anchors. There’s nothing on Earth like the sound of a hardened steel drill bit as wide as a hammer handle snapping in two because you’ve let it get too dull or haven’t poured enough coolant on it. The tip welds itself right into the steel you’re boring. The “CRACK” when the steel gives way is positively bone-chilling the first time you hear it. A guy across the line from me had a small drill bit explode right next to his hand, and cut his finger right down to the bone. He went to the hospital, got it sewn back together, and was back on the job the next day. It was tough, dirty work that paid $6.50 an hour, but we put up with it because Caterpillar hired people to run radial drills, too, but Cat paid twice as much with benefits out the wazoo. I don’t know if I even had health coverage or paid vacations. I was 20 years old and it didn’t occur to me to ask. The machine shop was a path to Cat, and that was enough. Everything went away in the spring of 1982. We all got laid off, even my uncle’s eldest son, with zero chance of getting our jobs back. My mom worked in personnel at the Morton parts plant; her prime duty was giving people their walking papers. White-collar folks who kept their jobs took pay cuts or freezes. My dad worked for Keystone, the wire miller, and got laid off for five months that year; when he came back he had to take the worst job in the factory and stayed there for a decade before he could get back to his regular job in the testing department. Everybody my age was out of a job that summer. I ended up going to Abilene, Texas, and getting a job as a floor sweeper for the city at $4.25 an hour. After that I was an assistant manager of a place called Hot Dog Castle. Then my mom bribed me to return to Peoria; she’d pay off my car if I went to college full time. That was the summer of ’83 and of course there were no Cat jobs anymore to tempt me with visions of easy rewards for unskilled labor. I went into journalism mostly because I had always enjoyed reading stories. I was not deterred by the fact that I’d never actually written one (such is the fearlessness of youth). In the spring of ’87, journalism degree in hand, I applied for a job with the public affairs division at Cat. It was nothing like working on the college newspaper, which was pure fun 40 hours a week. It was about helping Cat tell its stories in ways most friendly to the company’s bottom line. Didn’t get that job, which was just as well: I got a newspaper job and stayed in that industry till this day. I ended up back in Peoria again from ’93 to ’99, working at the Journal Star, but the dawning Internet age made me think I’d be happier in Silicon Valley, where all the fun was happening. I’ve been here since then. Truth be told, I didn’t give 10 seconds thought to Caterpillar between the summer of 1999 and two weeks ago. I heard rumblings of how the corporate culture had become so much more cut-throat over the years, but I figured it was mostly the old-timers longing for the good old days because memories blotted out all the stuff they griped about 20 years earlier. Things are as bad for newspapers today as they were for Cat in 1982, though this time I’m gainfully employed (for now). The plan is that those at Cat who still have jobs will stop in here to find all the coolest links about their employer in one central location. If enough do, I can make a living at it if the newspaper goes belly-up. That’s the thing about growing up in Peoria: you never get that Caterpillar yellow totally out of your blood. For an amazing junk-to-gem restoration, check out this link. A guy takes a pile of rust in the form of an ancient D2 dozer and works it back into showroom condition. 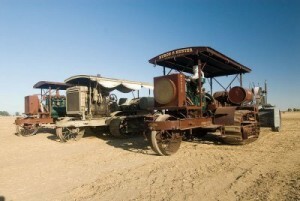 Antique Caterpillar Machinery Enthusiasts is another fine resource. The photo gallery includes an array shots from a 1914 Holt 75 that in 1919 became the first Caterpillar used in Australia. Cool. While we’re on the subject of old Cats, it’s always fun to see what’s selling on eBay. Cats hold their value pretty well, despite the abuse the endure. While the press is calling Benard Madoff’s scheme “the biggest Ponzi scheme in history,” Cramer says “Give me a break!” The biggest Ponzi scheme is not illegal, he explained, in fact it is run by the U.S. government. Social Security has the same setup as a Ponzi scheme. People who are currently working are paying for the retirement of the elderly now and hope they their children will be able to support them in old age. However, as in any scheme, those who get in early benefit, while those who get in last end up getting hosed. Experts are now saying Social Security will not be able to support the elderly by 2042, which means that people in their 20s are not going to reap the benefits of their labor. I would note that people have been predicting the demise of Social Security pretty much from Day 1. The Compact Construction Range from Caterpillar, represented by Caterpillar of Australia, is set to debut on television’s main stage with the season launch of reality show ‘KingGee Jack Of All Trades’ in early January. Pitting four contestants head to head in a series of building and landscaping challenges and tasks over eight fast paced episodes at a purpose built house at Silkwood Mt Cotton in Queensland, KingGee Jack Of All Trades will see the winner crowned Australia’s best tradie and the four bedroom house auctioned with proceeds going to charity. As major sponsor, Caterpillar equipment is cast in a starring role with a range of compact machines to be used by the contestants, as well as providing the major home viewers prize – a 226B2 Skid Steer Loader or 301.8C Mini Excavator from the Compact Construction Equipment range. You have to admit there’s something satisfying about construction work, especially when it’s being done by somebody else. The article notes the Cat equipment is largely joystick-driven these days so having to shove all those handles back and forth is a thing of the past (I’m sure this has been true for 20 years now, exposing how long it’s been since I’ve been in the vicinity of real work. I went to college to avoid that after a couple years machining parts for, you guessed it, Cat tractors). My favorite story from Grandpa Fowler was the one about his foreman getting after him because he was painting too many tractors. Charlie was a small, sturdy guy of mixed anglo-Cherokee stock. Probably about the most industrious human I’ve ever known. As I recall him relating the story, when he started out on the paint line the production quota was 13 a day. Over the years, the United Auto Workers had managed to shrink this quota to something like two tractors a day — you know, the guys needed time to perfect their yellow masterpieces; you wouldn’t tell Picasso to get a move on, would you? Trained to paint 13 a day, Grandpa Charlie could paint two tractors before his first coffee break. He’d fudge his production reports to stay out of trouble, but sooner or later his boss would crunch the numbers and find his paperwork didn’t match the supply of painted tractors on hand. He always confessed and promised to change his ways. But somehow I suspect the oversupply of painted tractors lasted till the day he retired back in the 1970s.